Brief Description: Are you an aficionado of the Scottish Football League? Are you up-to-date with all the latest fixtures and club news? Looking for an opportunity to test and extend your knowledge? Then this quiz book is just what you have been waiting for. 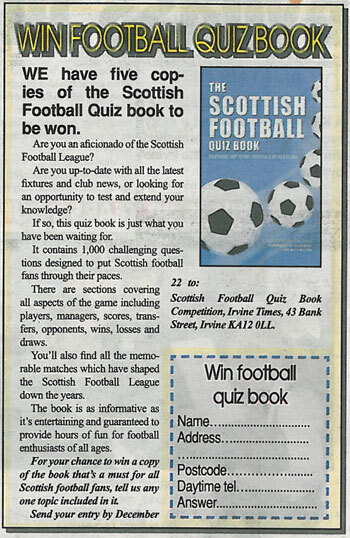 Containing 1,000 challenging questions The Scottish Football Quiz Book has been designed to put Scottish football fans through their paces. 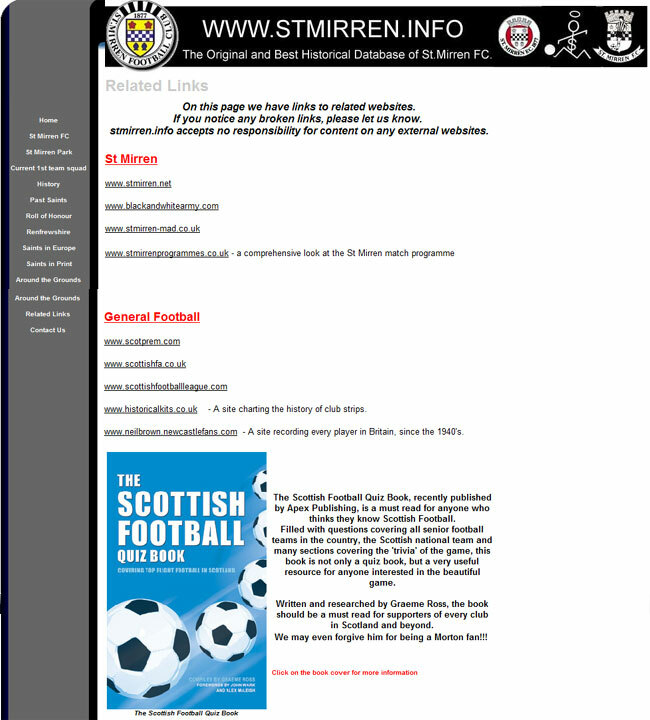 There are sections covering all aspects of the game including players, managers, scores, transfers, opponents, wins, losses and draws as well as all the memorable matches that have shaped the Scottish Football League down the years. This book is as informative as it is entertaining and is guaranteed to provide hours of fun for football enthusiasts of all ages. You’ll be crying foul and calling for extra time as you strive to recall all the people and places that have played an important part in the history of Scottish football. This fitting tribute is a must have for all Scottish football fans and anyone interested in learning more about the beautiful game north of the border. About the Author: Graeme Ross was born in Greenock in 1959 and has followed Greenock Morton for over 40 years. He is married with three children and two grandchildren, and has worked as a firefighter in Greenock since 1980. He has written articles for various magazines and has written two books on his favourite club 'Morton Greats' and 'More Morton Greats'. Although I never had the pleasure of playing in the Scottish leagues, I was honoured by my country on 29 occasions and played in the 1982 World Cup Finals. 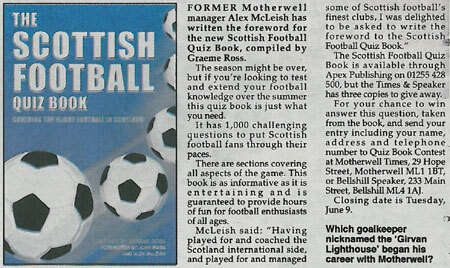 Therefore, I was delighted to be asked to write the foreword to The Scottish Football Quiz Book. Most people love a quiz, and footballers are no exception. I know that my old Ipswich and Scotland team mate George Burley in his capacity as Scotland Coach will love this book. We could certainly have used it to good effect in all those long motorway coach journeys with Ipswich! Graeme has packed a multitude of fascinating facts and figures into his book, and the questions will provide a keen test of the reader’s knowledge. 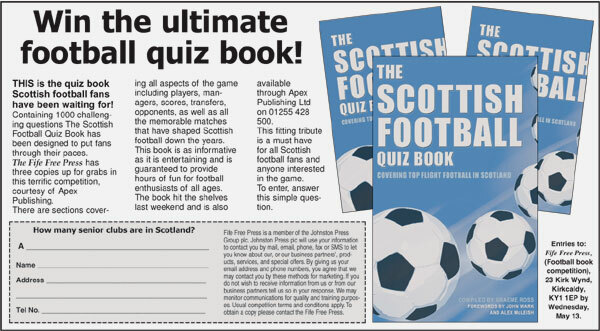 So, whether you support Aberdeen or Annan Athletic, or are simply a member of the Tartan Army, I can thoroughly recommend The Scottish Football Quiz Book to all followers of Scottish Football. I hope you enjoy the book, I certainly did! (Picture: John Wark with a copy of 'The Scottish Football Quiz Book'). 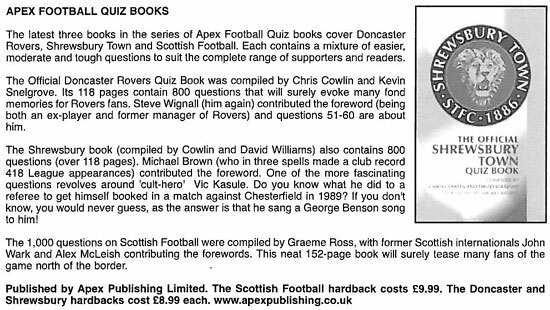 Having played for and coached the Scotland international side, and played for and managed some of Scottish Football’s finest clubs, I was delighted to be asked to write the foreword to The Scottish Football Quiz Book. This is a book that every student of Scottish football will enjoy immensely. With 1,000 questions on a huge range of subjects, there is something here for everyone, and I can guarantee that you will be entertained and fascinated by the wealth of facts and figures to be found in Graeme’s challenging book. And it’s not just fans of the big clubs who are catered for – there are questions on every senior club in Scotland, as well as the National side, and many of the great characters who have graced the football world. Reading through the book reminded me of many of great players Scotland has produced – even the ones that kicked me! Perhaps I can educate my Birmingham Sassenachs on the team bus! Enjoy the book, I certainly did! This is a fantastic book covering all aspects of Scottish football it is sure to test anyone interested in the beautiful game, go on give it a go! A must for all football fans of all ages. 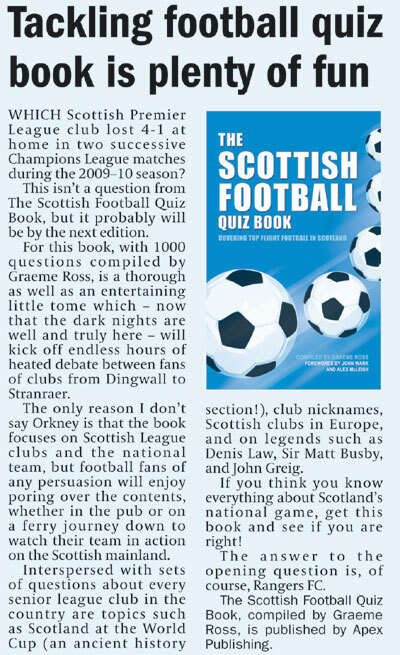 This superb quiz book will not only test and enhance your knowledge of Scottish football, but it will also increase your appreciation for it too. Expertly and entertainingly compiled by the author. A quiz book that is definitely worth walking 500 miles for! I can guarantee that you will be fasinated by the wealth of afcts and figures to be found in this challenging quiz book. It reminded me of the many great players Scotland has produced. This splendid book is certainly the answer for those of us who like quizzes and have an interest in football North of the border. Everything you should know about Scottish football. A must for every fan and anyone who wants to impress their mates in the pub. A must for all Scottish football anoraks out there. A cracking book which is sure to appeal to fans everywhere, whether they support Arbroath or Aberdeen, Raith Rovers or Rangers! 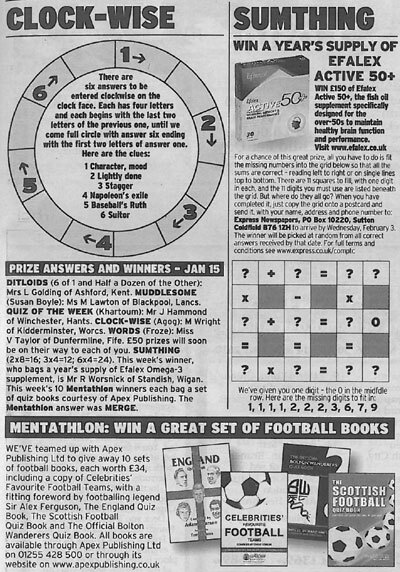 Morton fan Graeme Ross has come up with another winner ... now Scottish football fans can test their knowledge in his latest book that provides hours of fun and facts. 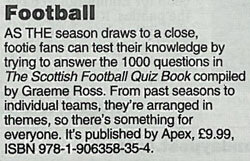 Trivia to test even the most knowledgeable Scottish football supporter. Nothing stimulates debate in this country like football. Arguments will rage in the workplace, the pub and the school playground. Who is the best player? Which team deserves to win the league? When are Scotland going to qualify again for a World Cup? 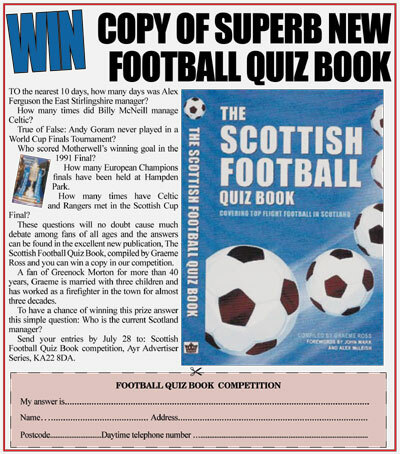 There is a huge appetite for information and football trivia and that is why we’re delighted to give away the Scottish Football Quiz Book. 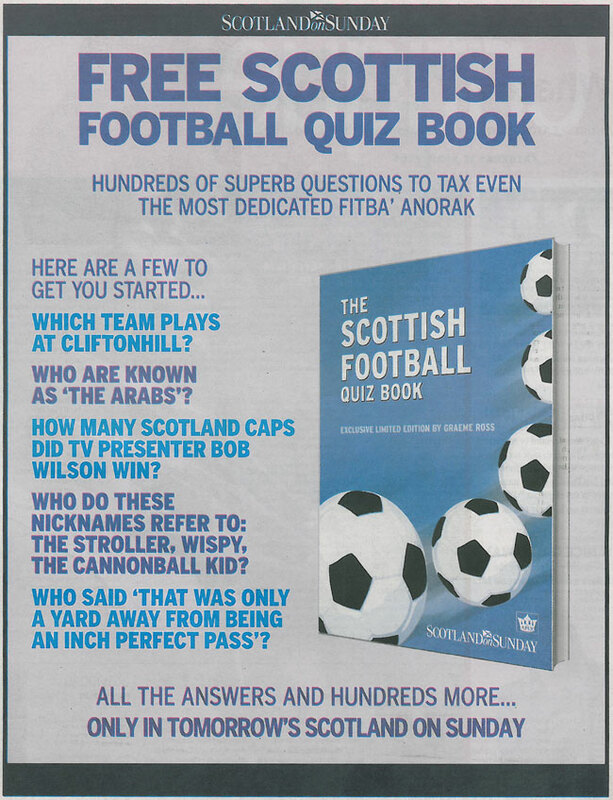 Containing over 200 questions that will tax even the most dedicated fitba’ anorak, the quiz book covers all aspects of the game north of the border. Hopefully, it will complement perfectly you’re Scotland on Sunday sports section and provoke a bit of debate over the breakfast table. The tartan bible for pie-munching fitba anoraks. A cracking read - a must for any Scottish football fan. A fact-filled slice of footballing fun. With 1,000 questions this is the ultimate quiz book. No one will get close to full marks. A significant and entertaining piece of work. Not only does it capture the essence and importance of Scottish football, but it underlines the global impact Scots have had on the game. Not only a must for quizzers everywhere, but a valuable resource for football historians. Fans will get a kick out of reading this book. This will kick off endless hours of heated debate between football fans from Aberdeen to Stranraer. A referee may well be required. To the football fan, knowledge is one scale by which they measure their commitment. What better way to enhance and illuminate that wisdom than this comprehensive and searching quiz book? 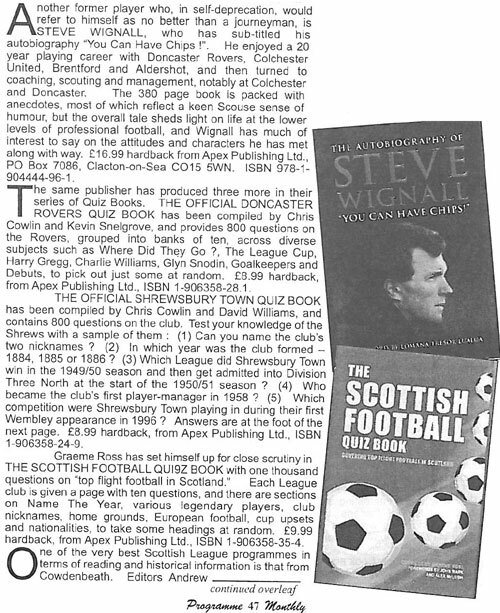 Scottish football's facts and figures are well served in this winning collection. A great journey through time as well as an entertaining way of finding out how much you know about the beautiful game. No Scottish football fan should leave the house without it. Think you know your Scottish football? Here's the chance to prove you're international class or guilty of schoolboy errors! A great football book, with plenty for fans of every team - perfect for those long away-day bus journeys! 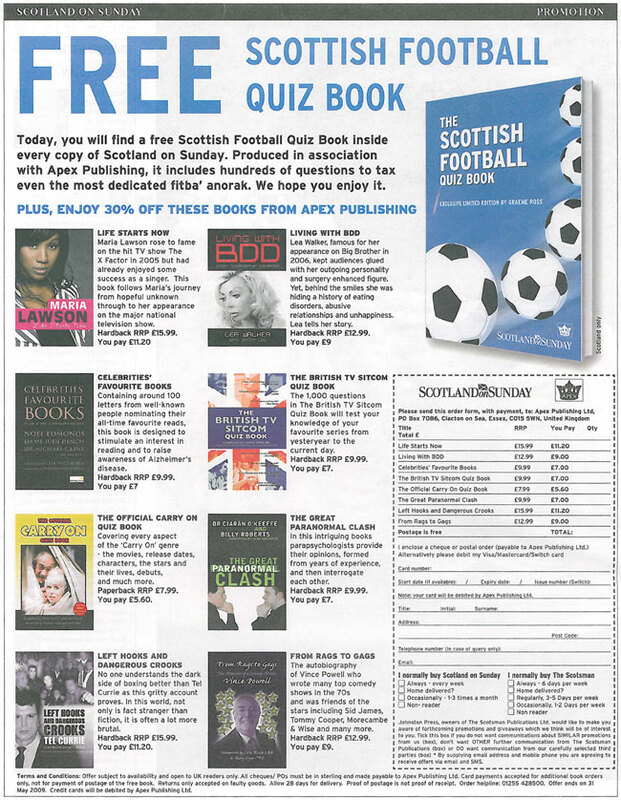 Without question, The Scottish Football Quiz Book is a must-have publication for EVERY fan of the beautiful game. 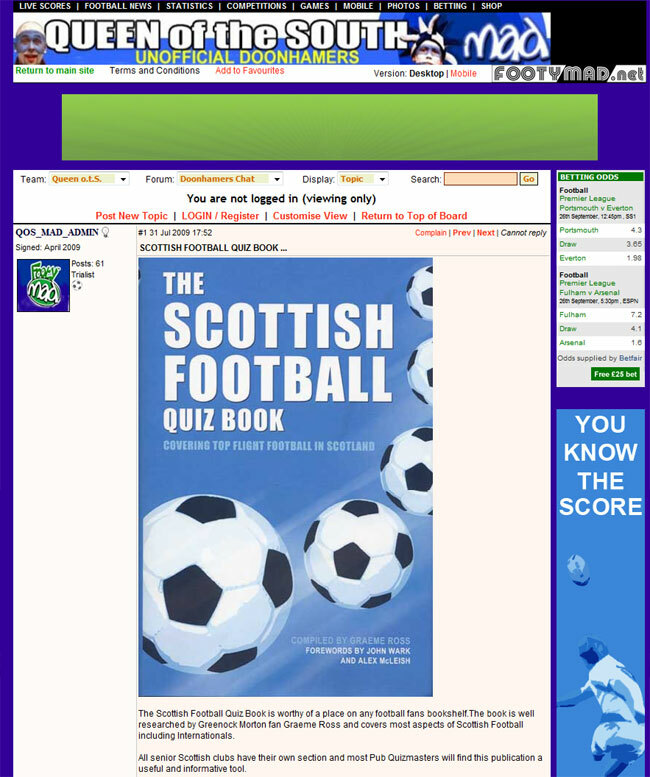 If you want to find out how much you know about your team - or just test your general knowledge of Scottish football - this is the answer. Almost as satisfying as a half-time pie and bovril, and infinitely more readable. This is a must read for members of the Tartan Army or indeed any football fanatic. The typical Scottish football fan loves nothing more than debating about the game whether it's in the pub or at the match. This book is perfect for it, with great questions on every team in the country. 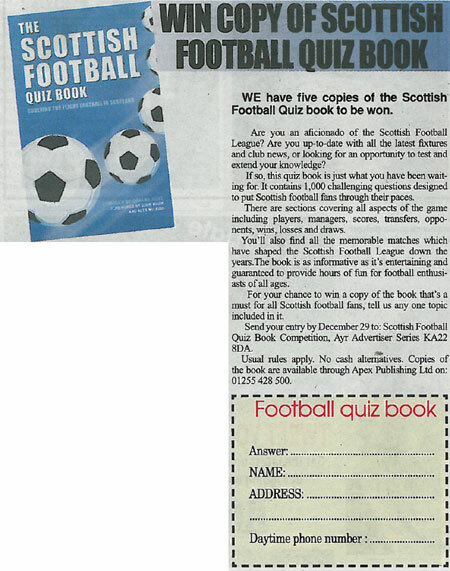 Usually football quiz books either cover soccer south of the border or perhaps take the questions to a worldwide level. 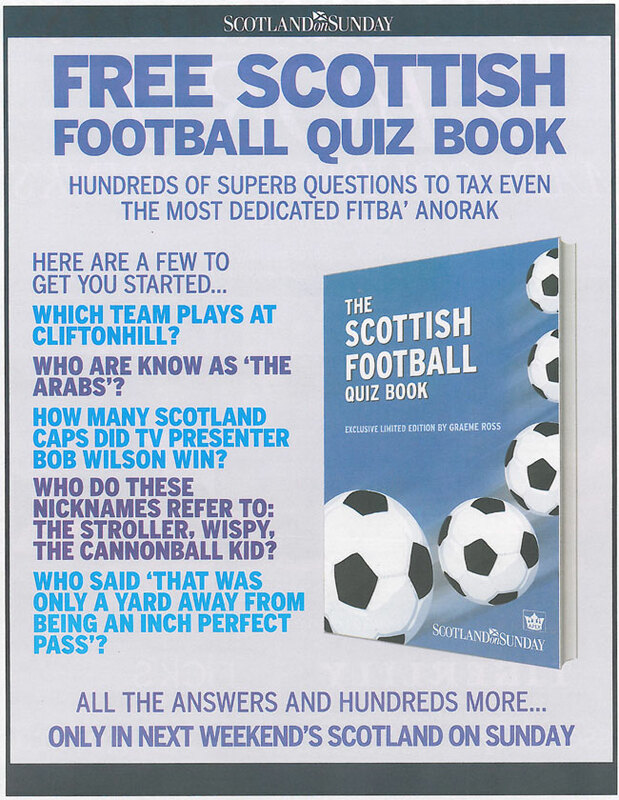 Now there is a recently published a book for those with a love of the game in Scotland and who like to test their football knowledge. 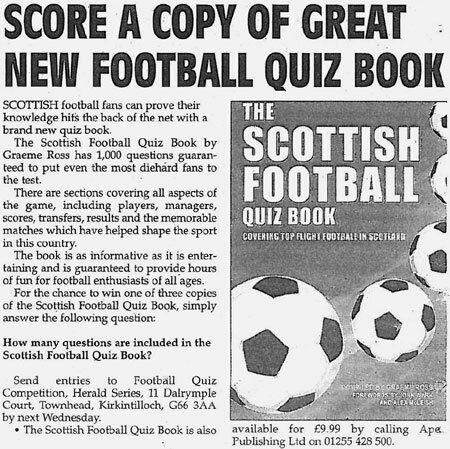 ‘The Scottish Football Quiz Book’ will certainly test how much you know, covering players, managers, matches and results, it will be as informative as well as providing that section of puzzlers to have you scratching your head. 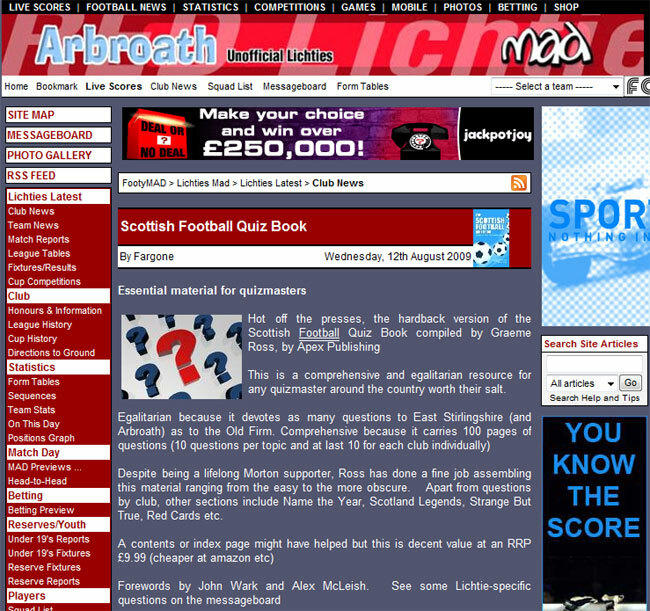 Every Scottish side has a section devoted to it which will lead you to question – how well you know your club? The book is compiled by Graeme Ross and published by APEX Publishing. Available at all leading stores, this is a must for every Scottish football supporter. Graeme Ross (AFAIK no relation) will be a familiar name to many on this site thanks to his ‘Morton Greats’ books. Now he has compiled a new quiz book on Scottish football. This is a particularly competitive field with several new publications each year. Many of these concentrate on the OF and the national team and are often “written” by well-kent faces who wouldn’t know the answers to any of the questions they have supposedly set. Fortunately that isn’t the case with this book. Graeme has compiled the questions himself, 1,000 in total comprising 100 different themes with ten questions each. 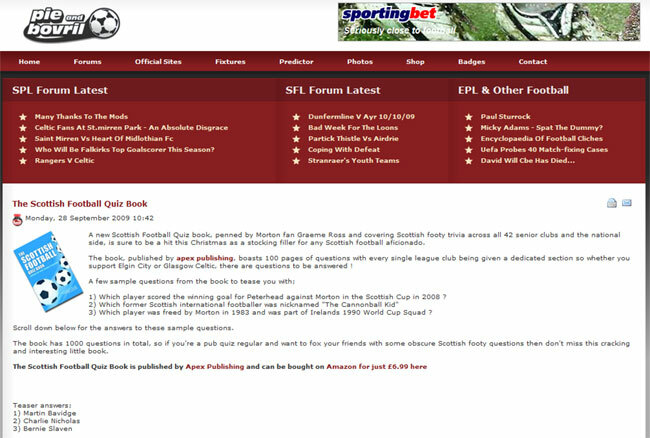 Every SPL & SFL club has a set of questions and other themes inlcude legends, scandals, nicknames, transfers, Europe, goalkeepers, quotes, grounds, World Cup, ‘expert’ and many others. Even including those considered as legends the Old Firm account for only around 10% of the questions and answers. So this is as representative a series of puzzlers on the game as you are likely to find anywhere. There’s something in here for everyone, no matter which club they follow, and this book will settle many arguments as well as help pass the time on long away journeys. There are forewords from Alex McLeish and John Wark and at just £9.99 for a hardback with 150 pages this represents excellent value. If I have one quibble it’s the lack of a contents page, which means the reader isn’t able to find his or her favourite theme or club without wading through the pages. I don’t think it would have done any harm to have dropped one of the eight pages of reviews to include a list of contents at the front. But that’s a minor issue really and no one will be disappointed by what they find between the covers. Graeme Ross was interviewed on Leith 98.8 FM. 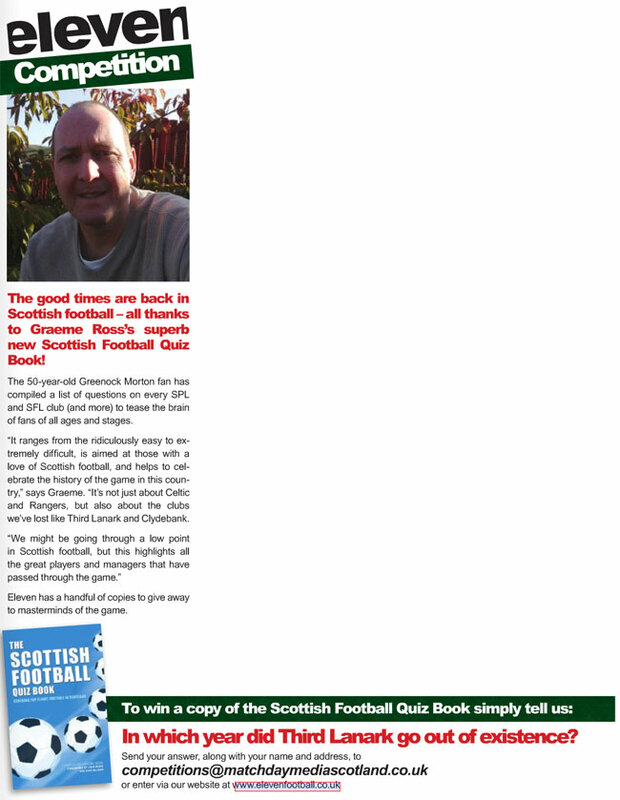 Graeme answered questions about his book 'The Scottish Football Quiz Book'. Graeme Ross was interviewed on Smooth Radio Scotland 105.2 FM. 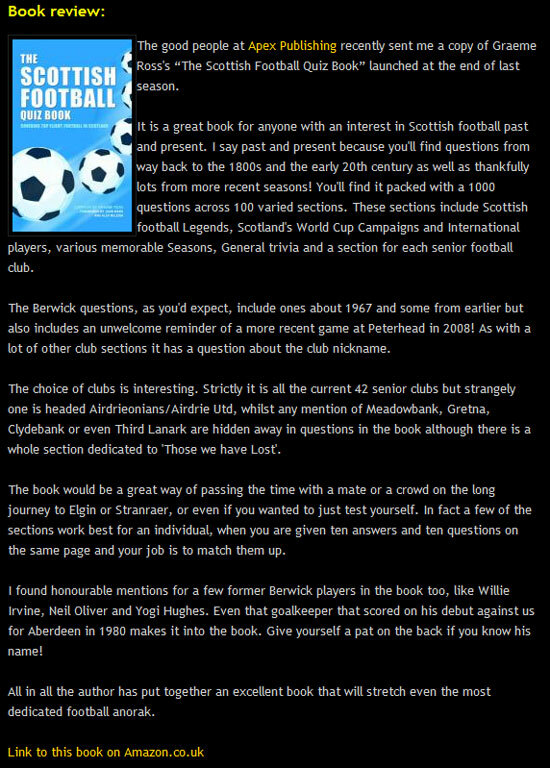 Graeme answered questions about his book 'The Scottish Football Quiz Book'. He was interviewed on 'The Dougie Jackson Show'. 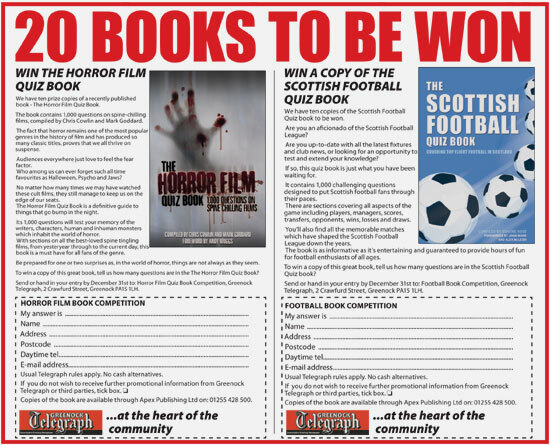 Moray Firth Radio featured and run a competition on 'The Scottish Football Quiz Book' compiled by Graeme Ross. 14 March 2010 - Graeme Ross was interviewed on Clyde 2 1152 AM. 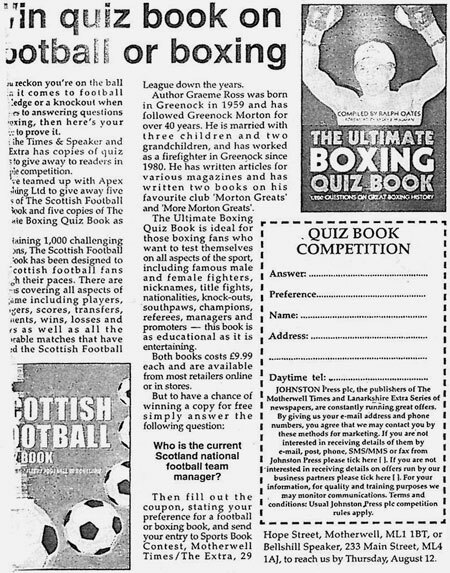 Graeme answered questions about his book 'The Scottish Football Quiz Book'. I think this is BRILLIANT, it is just brilliant to see so much about ALL of the scottish teams. Brilliant fun that I'm sure people will learn so much from. If you think you know about football – get this book and prepare for the biggest challenge of your life! Ideal trivia for matchday banter - as essential to the Scottish fan as pie, bovril and novelty tartan hat! I thought I knew a lot about Scottish football until I read this, now I'm not so sure! You will know more than you think you knew and discover you know less than you thought you knew! What a book! Most of my questions on Scottish football are about Alan Rough, like: How did he ever manage to turn up for a game on time? However, here you have a book full of interest for all fans of the beautiful game in Scotland. Want to test your knowledge from caps to cups and from legends to leagues? 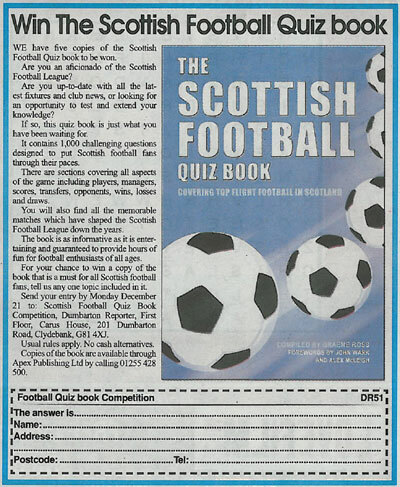 Then get your hands on 'The Scottish Football Quiz Book'. Quality, fun and a must for footy fans. A great way to spend a boring Sunday afternoon! I am doing my Xmas shopping early and buying this for my brothers! The question is: Why have we waited so long for this? If you thought you knew all about Scottish Football, then think again. Everybody can learn new facts and stats. 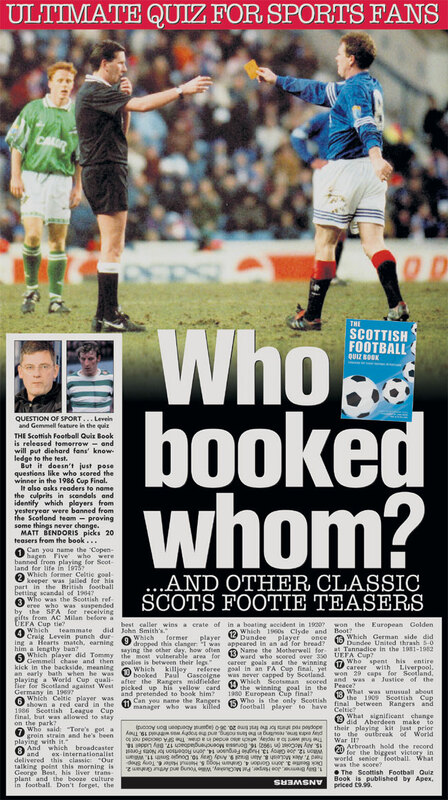 The ultimate test of knowledge for any diehard Scottish football fan. Find out who REALLY knows their stuff! This is a fascinating quiz book which is well researched and presented. Football fans all over (not just in Scotland) will spend many hours enjoying it as well as learning a host of interesting facts about Scottish Football. 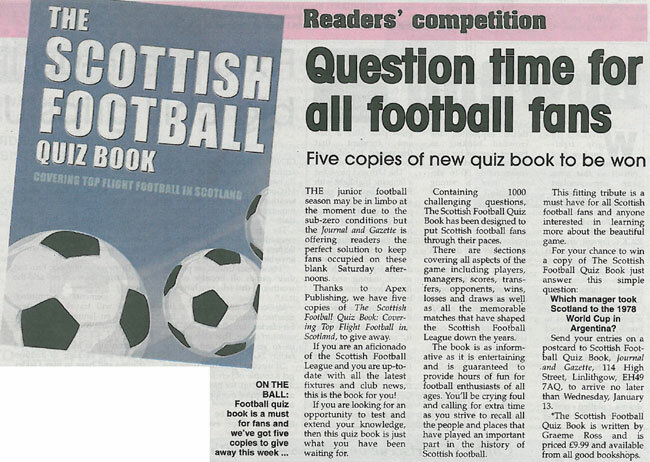 24 May 2009 - 'The Scottish Football Quiz Book' was featured on Smooth Radio Scotland 105.2 FM. The presenter reviewed the book on 'The Alex Dickson Bookcase Show'. 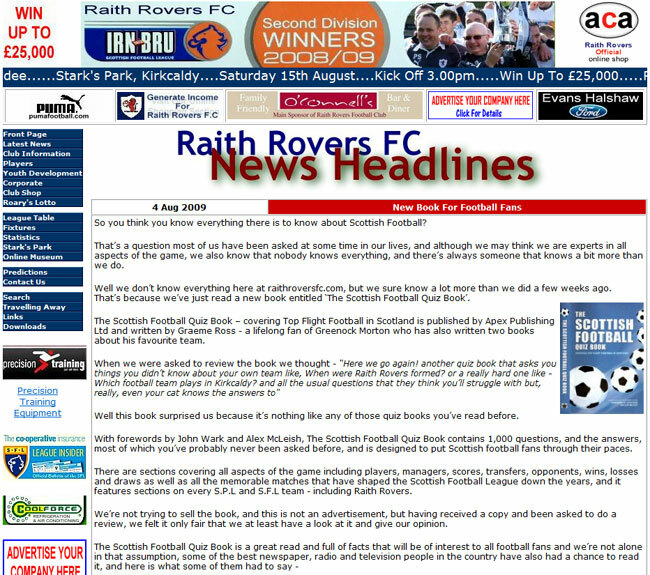 23 May 2009 - Graeme Ross was interviewed on Radio Borders 96.8 FM. 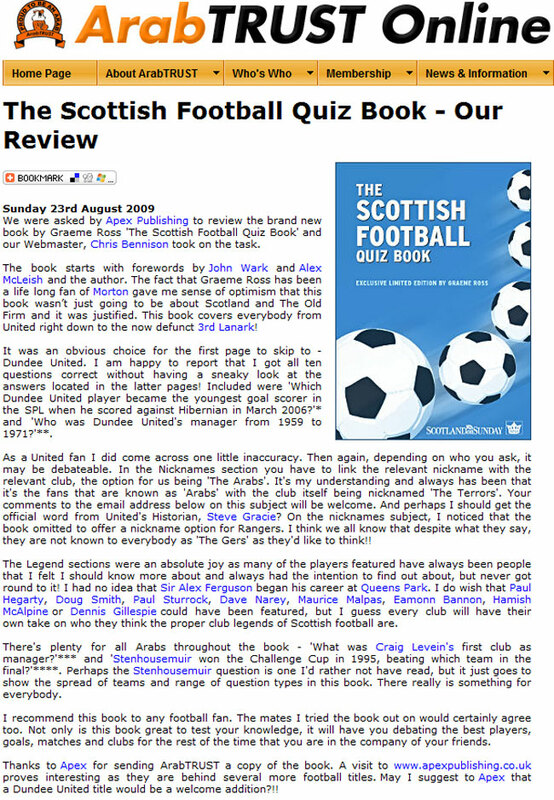 Graeme answered questions about his book 'The Scottish Football Quiz Book'. He was interviewed on 'The Hugh Brown Show'. Thoroughly excellent. It shows Statto who's boss! Those of us who are Scottish football fans know it's not the despair that gets to you - it's the hope. This is enough to cheer us all up. A must-have for any serious fan - and for the not so serious fan too. 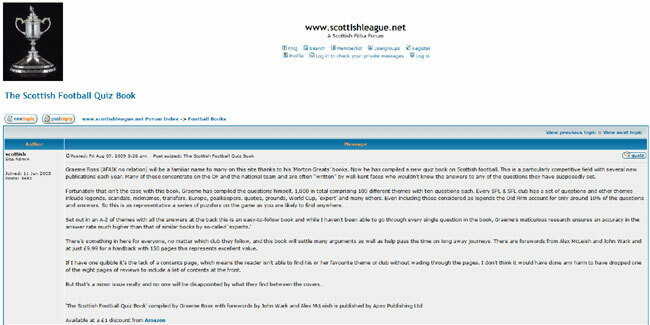 25 April 2009 - Graeme Ross was interviewed on West Sound Radio and during the interview he questioned the presenters from the contents of his book The Scottish Football Quiz Book. 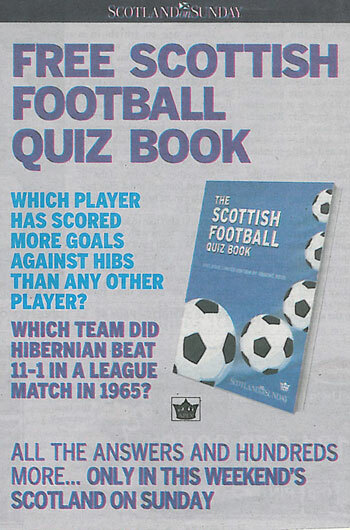 As a football fan, I found this quiz book great fun. You can pick it up anytime and test your football knowledge and surprise yourself with what you do or don’t know about the beautiful game. If you have even a passing interest in Scottish Football ... this book will make you a fan for life. Featuring every SPL and SFL club, no Scottish football fan should feel left out! Perfectly pitched for both the casual football fan, and the complete anorak. A fascinating book of Scottish teams and legends a must for all football fans and quiz hosts. Ever stuck with things to say at the pub? Worry no more - the ultimate footie book is here to make you seem interesting. Hours of eye brow raising fun and facts. 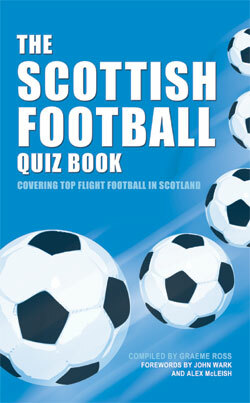 This is the very book for Scottish Football fans, it's full of all the answers you're looking for. What an absolute gem of trivia - I loved the different categories and questions ... and I actually knew a few answers as well! A huge amount of research has gone into this book and what a result! It's been great fun going through it. Guaranteed to invoke heated debate, even a stramash - in the pub. 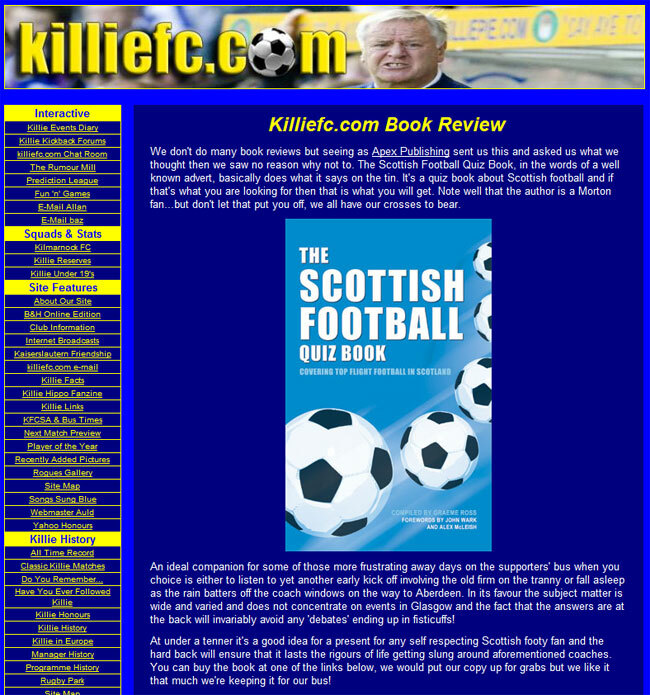 A true compendium of Scottish Football knowledge and a must for any fan wanting to test their knowledge! Covering every inch of the beautiful game from your favorite team, club, and players! A quick ready through and get prepared to win a lot of arguments! If only every pub in Scotland had one behind the bar! An excellent read that deserves a place on every bookshelf. What an excellent quiz book an essential item if you are creating a quiz night or radio competition. A doorway into Scottish football trivia heaven! Everything you know, want to know and thought you knew is here. Enjoy! A must for very football encyclopediac. A brilliant book full of all the things you should know or would want to know about Scottish Football. This book is a must for all quiz fans or just a lover o the game like myself. I thoroughly enjoying reading all the facts of the various teams and player. Great to see Alloa Athletic and the likes of John White getting a mention instead of the ‘Old Firm’ who usually get all the attention. Great all round, informative and fun! This book is suitable for all football supporters. It is not biased towards any club and will be an asset in quizzes. I found the book full of interesting facts, it was exciting & stimulating. It would be great for anyone organising a quiz. Congratulations to Graeme Ross. Very enjoyable. So refreshing to read a Scottish Football book which goes so far beyond the tedium of the old firm. 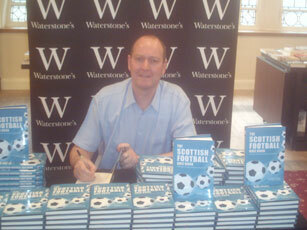 Graeme Ross signed copies of his book 'The Scottish Football Quiz Book' at Waterstone's, Sauchiehall Street, Glasgow. 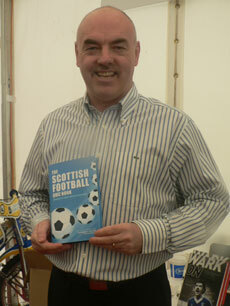 Graeme Ross signed copies of his book 'The Scottish Football Quiz Book' at Borders, Royal Exchange Square, Glasgow. 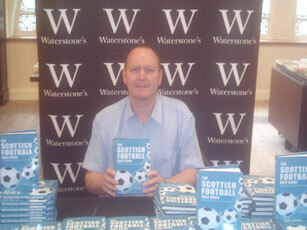 Graeme Ross signed copies of his book 'The Scottish Football Quiz Book' at Waterstone's, Ayr.